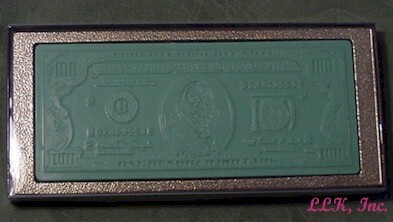 Shown left is plain, right is gold dusted. 3 oz., poly bagged, tied with ribbon. 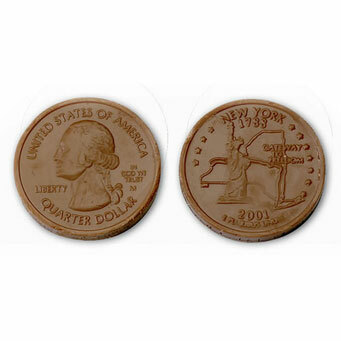 Highly detailed, solid premium milk chocolate gold coins, wrapped in Italian foil. 1 1/2" x 1 1/2" x 1/4". Approx. 69 pcs/lb. 10 lb case. Kosher OUD. IMPORTANT CASE SHIPPING INFO! 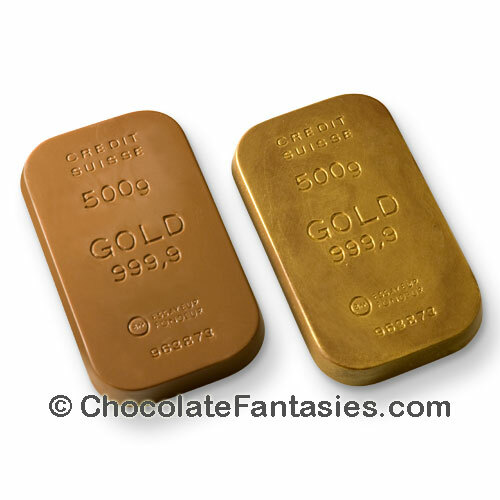 Highly detailed, solid premium milk chocolate gold coins, wrapped in Italian foil. 1 1/4" DIAM. & 1 1/2" DIAM.. Approx. 93 pcs/lb. 10 lb case. Kosher OUD. IMPORTANT CASE SHIPPING INFO! 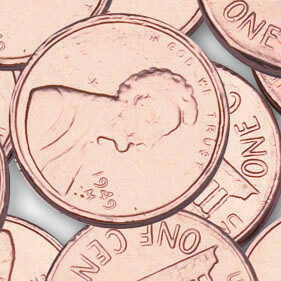 Solid milk chocolate 1 1/4 inch coins stamped as a silver state quarter. 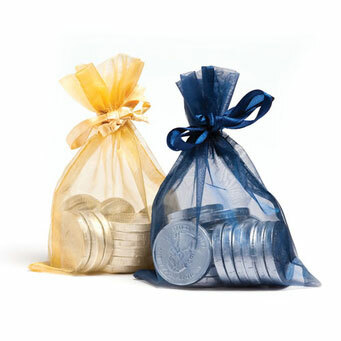 Available bulk in 10 lb case (112 pcs/lb) or 48 2 oz attractive 5 x 2 x 1" blue or gold organza bags with a ribbon tie. Kosher OUD. IMPORTANT CASE SHIPPING INFO! 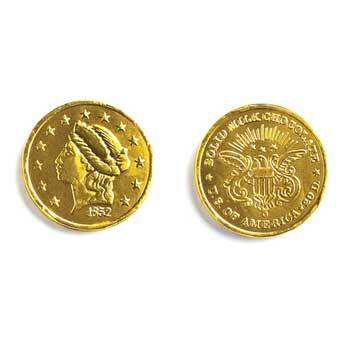 Highly detailed, solid premium milk chocolate gold coins, wrapped in Italian foil. 1 1/2" DIAM.. Approx. 63 pcs/lb. 10 lb case. Kosher OUD. IMPORTANT CASE SHIPPING INFO! 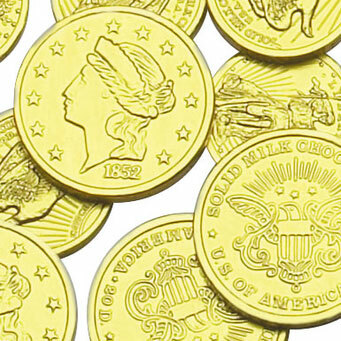 Delicious foil wrapped chocolate coins. Choose from many styles. Drop shipped from manufacturer. No free gift with case orders. IMPORTANT CASE SHIPPING INFO. Kosher OUD. 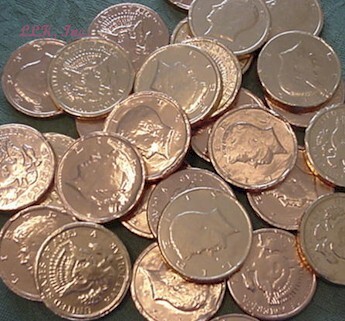 $262.99 - 144 Mesh Bagged Gold Coins 1 oz. ea. 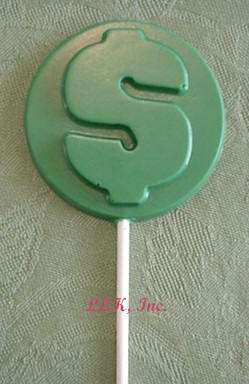 MILK CHOCOLATE (SUGAR, MILK COCOA BUTTER, CHOCOLATE, SOY LECITHIN - AN EMULSIFIER, VANILLIN - AN ARTIFICIAL FLAVOR). 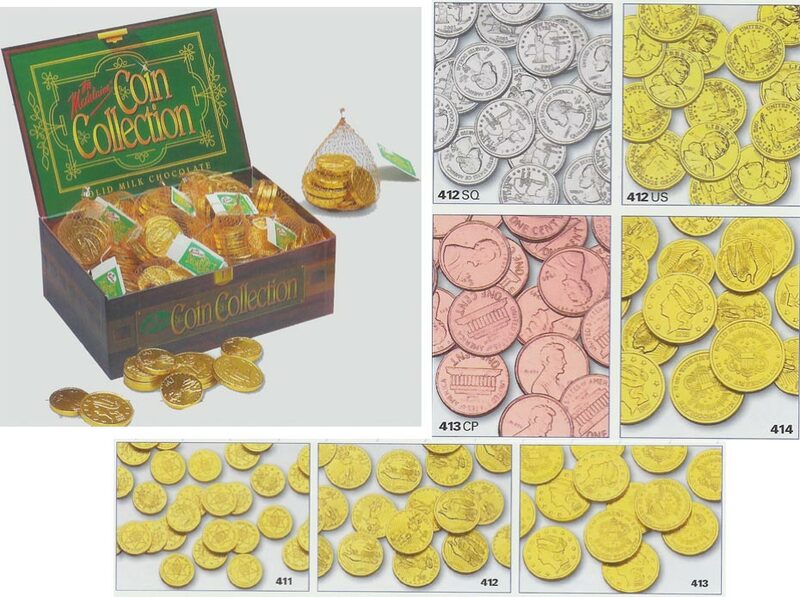 Chocolate coins are perfect for pirate loot, party favors, balloon weights, Chanukah gelt, stocking stuffers, Christmas traditions, St. Patrick's Day, Chinese new year and Mardi Gras.